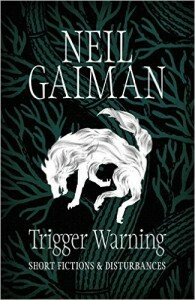 “The Man Who Forgot Ray Bradbury” by Neil Gaiman is published in Trigger Warning: Short Fictions and Disturbances. According to Gaiman in his commentary to the book, this story was written as a ninetieth birthday present for Ray Bradbury. He said it was triggered by being unable to remember the name of an old friend, which is something that happens to all of us now and then. It is a great example of taking a single occurrence, an idea, and running with it, making it into something amazing. Gaiman manages to evoke the feelings and thoughts that someone who is losing their memory might have, and to make those thoughts and feelings utterly believable and real. It was difficult to follow in places, but that was by design. The story is written in the first person from the point of view of the person losing their memory, and it is an effective way to get across the confusion caused by the lack of labels off which to hang thoughts and concepts. Loved it. “Lockdown” by Saul Tanpepper is a story from The Doomsday Chronicles. A teacher is in lockdown, designed to guard against a gunman on the school grounds, with two of her children. The classroom door is locked and the blinds are drawn across the windows and they aren’t allowed to leave or make a noise. The lockdown was triggered by a global epidemic that caused a virus to affect people very suddenly and quickly. Within hours the electricity is out, the internet is intermittent, as is phone signal, as the world falls to ruin. A good story. It kept me on the edge of my seat and biting my nails for much of the second half. However, it was the same old end of the world story told in a different way. There are only so many original ways this kind of story can be told, but this is a good way, focusing on one main character and two or three lesser characters, one of whom is funny and entertaining. It works. I read “The Model” by Guy de Maupassant in Selected Short Stories, the collection of stories that I have been working through on and off. I tend to turn to them when I need something short and straightforward, but the problem with that is that there is nothing much to say about them. This story tells of a painter who is married to a disabled ex-model. The story of how they were married is told by a friend of the painter to an acquaintance as they watch the married couple taking a walk together but not speaking, she in a bath chair. Before they were married, the painter left her, but she chased him down and said she would kill herself if he went off and married someone else. So he told her to go ahead. She did, jumping out of a window and breaking both her legs. Out of guilt and remorse the painter married her. It is an interesting way to tell a story. It starts by describing the place in which it is set, and then describing the married couple taking a walk. Then the narrative switches to the two young men and the story is told from the point of view of one of them. “The Truth is a Cave in the Black Mountains…” by Neil Gaiman is a wonderful piece of work. There is a lot going on, but not on an obvious level, although the story is a straightforward one. It has some history according to Gaiman’s commentary on it, but this is my first encounter with it. 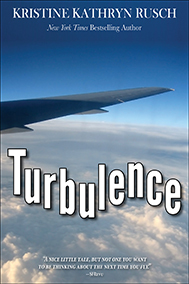 It won the Locus Award for Best Novelette. Set in the Isle of Skye, it is based in old stories of the islands, myths if you will. These myths are woven together into a wonderful story of revenge. It is easy to give up with this one in the first few pages, I think, because it is not clear what is going on and it is quite dark, but please persist and enjoy the language and the images that are formed in your mind (a great strength of Gaiman’s writing, generally). One to read and enjoy again. Story-telling to aspire to. “The Null” by Vincent Trigili was first published in The Telepath Chronicles in 2014. I read it in The Future Chronicles – Special Edition. A fairly standard vigilante story, but a lot of fun, lots of action and a good ending. However, I reckon he had a novel here. There was too much packed in, but not enough characterisation and no emotion. When he discovers his wife and child have probably been killed when his house explodes, he doesn’t react in a normal way, or even an abnormal way — he doesn’t react at all. There is a lot of scope for development here. 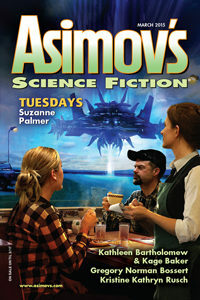 “Tuesdays” by Suzanne Palmer is an Asimov’s Science Fiction magazine Readers’ Awards Finalist in the short story category. It was originally published in Asimov’s March 2015 issue. Currently, this story and most of the other finalists are available to read for free on the Readers’ Awards Finalists page at Asimov’s. Didn’t like this at first, because of the way it was constructed. There was a bit of unnecessary (in my opinion) back and forward in time, flashbacks I suppose, but once I got used to it and understood what was going on, it grew on me. Really, it is a long joke. There is a punchline at the end that makes the whole thing worth while. Amusing throughout, competently written, good characterisation, though a little caricatured in places. I ended up thoroughly enjoying this. An excellent piece of entertainment. I’ll be surprised if it wins the short story category award, but a worthy shortlistee. “The Thing About Cassandra” is a story in Neil Gaiman’s latest collection of short fiction, Trigger Warning: Short Fictions and Disturbances. An excellent twist in the tail story. Once again I have to be careful not to give too much away. Stuart is at a stag party for a friend, and is told that his first girlfriend, Cassandra, who he lost his virginity to twenty years before when he was fifteen, wants to get in touch with him again. However, being at an age when there is a lot of pressure from peers to have girlfriends and sexual experiences, he had made her up. She was imaginary, but based on some photos he found outside a photo booth. There is a lot more to it than this, but he does eventually meet his imaginary girlfriend. This is a great story. Loved it. Brilliant. And it has an ending (which the one yesterday kind of didn’t have). “The Lunar Labyrinth” is the first story in Neil Gaiman’s latest collection of short fiction, Trigger Warning: Short Fictions and Disturbances. It is a story about a tourist visiting a burnt down maze on the night of the full moon. I can’t say any more without giving it away, although I had to read it twice to get an ending that made sense. Perhaps I wasn’t paying full attention the first time. Nicely written, as is to be expected from Neil Gaiman. I will almost certainly read all the stories in this book, but I will only comment on the ones that really have an impact on me. Of course, that could be all of them. 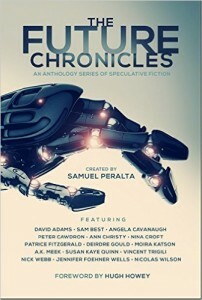 “Humanity” by Samuel Peralta was first published in The Robot Chronicles in 2015, and reprinted in The Future Chronicles – Special Edition. A relatively short story, this is set in a nearish future, when robots and artificial intelligence are advanced enough to appear human. After a multiple vehicle crash in freezing conditions, a lorry driver attempts to save a mother and daughter, until he realises that the daughter is a robot, and therefore not worth trying to save. A very good story, the events on the ground are interspersed with news reports about the crash. This is another good approach to telling a story, although it can be a bit annoying if it keeps on interrupting the action. In a short short story like this one, that was not a danger, but in a longer piece it may be. 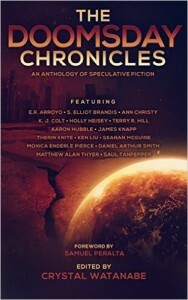 “Humanity” was the last story in this anthology, so I will be moving on to something new, but at some point in the near future I will be trying out another anthology in the Future Chronicles series of books.